View our selection of Green Teas from all over the world. We carry a wide range of Green Teas, including Traditional Green Teas, Matcha Green Tea, Flowering Tea, Jasmine and other Premium Green Teas. 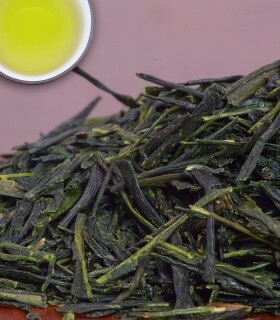 Our Green Teas come from around the world, however the majority come from Japan & China. We recommend experimenting with Green teas from each category as each bring unique, exciting and often bold flavours. Traditional Green Teas originated in China, however more recently have become associated with many different places throughout Asia. We offer a number of different Traditional Green Teas including Japanese Sencha & Bancha Green Teas, Matcha Green Teas, and a variety of different organic Green Teas. Browse our selection of Traditional Green Teas below, or to see our full range of Green Teas visit the Green Tea section. Matcha Green Tea is a powdered green tea, traditionally used in the Japanese Tea Ceremony. Matcha is produced from the leaves of shade-grown tea, and then ground into a fine powder with a hand mill. Beyond simply using it for making tea, Matcha is also widely used for cooking and for making green tea iced cream. In contrast to many other types of green teas that are steeped and then the leaves are discarded, the actual ground up leaves are ingested when drinking Matcha. Because Matcha Green Tea is powdered, it is also prepared quite differently than traditional steeped teas. Typically the tea is made by mixing a thid of a cup of water with a teaspoon of the powder, and then whisking them together with a Bamboo Matcha Whisk. We carry all of the components required to properly prepare Matcha in our Matcha Accessories section. To see all of our Green Teas, visit our Green Tea section. One of the wonders of the tea world, flowering teas are bundles of dried tea leaves wrapped around various types of dried flowers. 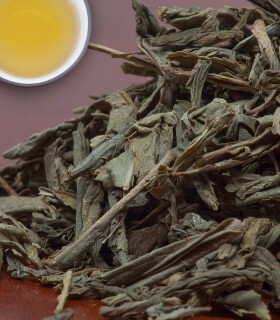 When steeped, the bundles rehydrate and unwind in a manner similar to a blooming flower. Typical flowers used in flowering teas include chrysanthemum, hibiscus, amaranth and more. Make sure to steep in a clear pot to get the complete experience! Most flowering teas can be steeped multiple times without becoming bitter. Browse our flowering teas below or to see our full range of Green Teas, visit the Green Tea section. The holy grail of Green Teas! 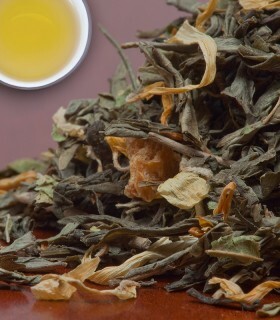 Jasmine green tea is green tea that has been scented with jasmine blossoms. Jasmine is wonderfully sweet and fragrant and is the most famous scented tea in China. If you are a green tea fan and haven't tried jasmine - you must. Browse our selection of Jasmine Green Tea below or visit our Green Tea section to browse our full selection. Our Premium Green Teas are hand selected from across Japan. From the highest grade Gyokuro Teas to the bright, fresh teas of Sencha, each has its own rich and unique flavours. Our Premium Green teas are a wonderful treat for the green tea aficionado. Browse our selection of Premium Green Teas below or visit our Green Tea section to see our full line of Green teas. A great way to experience a variety of green teas. Japanese Bancha with toasted and popped rice kernels. This combination gives a nutty flavour! 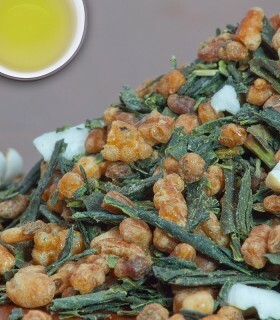 Sometimes referred to as popcorn tea (popcorn is occasionally substituted for rice in western blends of Genmaicha). To see more Traditional Green Teas visit the Traditional Green Tea section or to browse all of our Green Teas visit the Green Tea section. 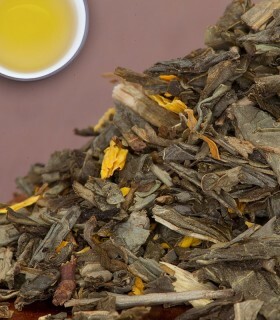 Japanese style Sencha combined with Gingko Baloba leaves, calendula petals, and natural sweet peach flavour. The natural sweetness of gingko combines well with the natural peach flavour. Great digestive after a full meal. Our Green Chai is the perfect blend of high quality green tea and flavourful chai spices! Chai is a word meaning tea and green chai gives off definite sweet notes and a distinctive flavour. Smooth tasting CO2 decaffeinated Sencha green tea and natural lemon flavour. Definite lemon notes come through with a slight sweetness. Enjoy hot or cold. 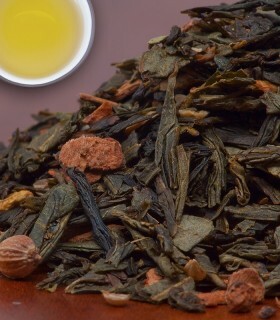 This is the decaffeinated version of our tropical fruit blend with Sencha style green tea. The tea has been decaffeinated using the CO2 process. This ensures that the aroma of the tea maintains intact. Great hot or iced. 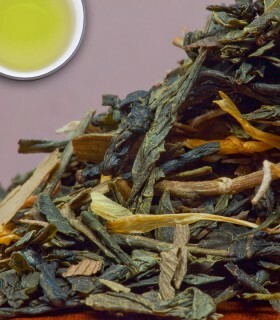 CO2 decaffeinated Sencha style green tea from China. Wonderfully mellow and aromatic. A lot of decaffeinated green teas have had all their flavour pulled out by the process but this green tea stands up to the best regular green teas that we carry.